Aerohive Networks, a cloud networking leader has released next-generation, advanced spectrum analysis capability. The new capability enables customers and partners to easily diagnose and mitigate network performance issues resulting from RF interference. They develop a series of cloud networking access points for 802.11 applications. 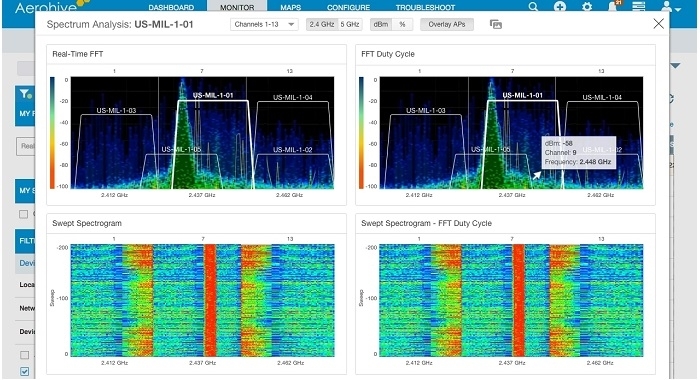 Aerohive's Spectrum Analysis feature detects interference from non-Wi-Fi radio devices. No additional hardware or licenses are required to use this feature, which detects radio signals from devices such as Bluetooth, microwave ovens, and cordless phones. Data on performance-reducing interference sources is fed into the Aerohive Channel Selection Protocol (ACSP) to mitigate interference from non-802.11 devices. In today’s wireless networks, RF interference will inevitably occur. It can be caused by Wi-Fi enabled devices, like company-issued laptops and smartphones, BYOD and IoT, or by non-Wi-Fi devices, like Bluetooth headsets, cordless phones or microwaves. Aerohive’s advanced spectrum analysis allows network administrators to easily determine the extent and source of the interference, and effectively address the resulting performance impact. Unprecedented ease of use is achieved by seamless integration into HiveManager NG’s alerting and troubleshooting capabilities, and intuitive graphical representation.